Things Look Different After Dark. See for Yourself. Thursdays After Dark. 6-10pm every Thursday night at the Exploratorium. Adults-only (18+). Lose yourself in over 650 interactive exhibits exploring perception, art and science. Grab your friends and a drink and get immersed in everything from a pitch-black dome, to a fog bridge, large-scale kaleidoscope, dazzling light displays, mind-bending mirrors and more. Or savor adults-only programming: featuring unique guest speakers, great music, cutting-edge films and one-of-a-kind activities. It'll change how you think about the world around you. But don't take our word for it—see for yourself. 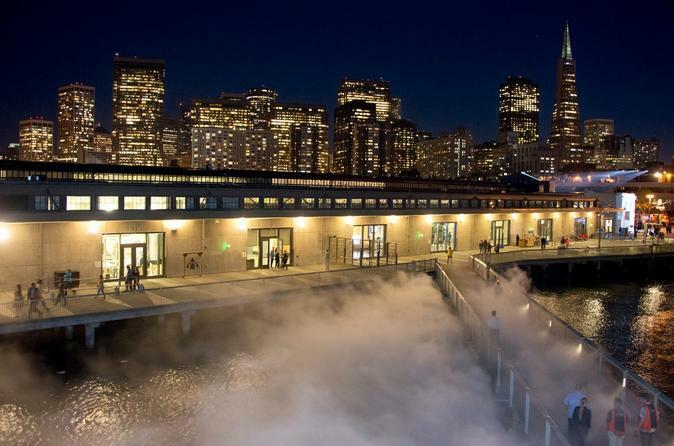 The Exploratorium is located at Pier 15 on San Francisco's Embarcadero – just minutes away from the Embarcadero BART Station, Pier 39 and the Ferry Building. With mobile tickets, skip the line and simply scan your phone for direct entry in the Exploratorium! Expand your mind by exploring the hundreds of interactive machines, contraptions and artworks at San Francisco’s Exploratorium, a quick 10-minute walk from the Ferry Building and a 15-minute walk from Fisherman’s Wharf. Head down on any Thursday at 6pm for the wildly popular After Dark event, when the museum stays open until 10pm for a full evening of adults indulging their curiosity about science and art. Each night revolves around a different theme. The Exploratorium is an intellectual playground for adults — part art gallery, part museum, part laboratory with a dash of party thrown in the mix. Work your way through diverse exhibits that explore cutting-edge technology, while a DJ spins music. Sip on cocktails (own expense) as you mingle with people and discuss the thought-provoking displays. Watch new exhibits be crafted right before your eyes in the Machine Shop and get hands-on experience in the expanded Tinkering Studio. The particular installations and performances vary each evening, but all attract a crowd as diverse as the exhibits, from scientists to musicians to fashion designers and computer programmers. Learn about how people interpret their surroundings in the West Gallery and don’t miss the installations that surround the beautiful waterfront building and form the Outdoor Gallery. Examine life at different scales, from tiny microbes to interconnected ecosystems, in the East Gallery. Then indulge in tasty appetizers and take in the spectacular bay view through the floor-to-ceiling windows at the SeaGlass Restaurant (own expense), a perfect way to cap off the evening.